Aloha! Thank you for visiting! We are Sean and Judy, a husband and wife photography team. We hope to be a part of your special day, whether it be a wedding or vow renewal! We have partnered up with other companies so we can offer a broader range of services. If you want same-day video services for your wedding, we can arrange that for you through Aria Studios or Sprout (by Aria Studios). Our three main cameras are Nikon's full frame 36MP D800 and D810. The D800 and D810 cameras are capable of producing beautiful, high quality images which can then be placed on a large canvas to hang on your wall. We also use Nikon's top-of-the-line lenses (f2.8 14-24mm, 24-70mm and 70-200mm). Every camera we use has dual memory card slots, if one card fails or is lost, your images will still be stored and saved on the second memory card. We provide fully edited JPEG images on a flash drive. The images you receive will not have our logo on it and will be copyright free, you will own the pictures. You will also receive a print release form so printing companies will not hassle you during your attempts at printing pictures. We will ask permission before we post any of your pictures into our portfolio. We can also print your photos for you at cost (we will not be making a profit on printing). Costco prints are affordable and the images are more than satisfactory. If you want the highest quality prints, we use Photo King. 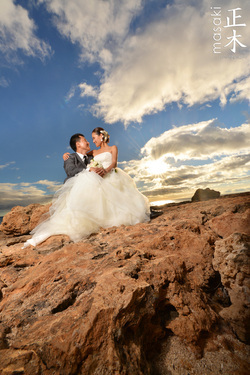 Please call Photo King for printing prices (808-839-0881). Please see our "packages" section for pricing. You can contact us by using the form below or calling Sean Masaki at 808-387-2156. Mahalo!